The moment I stepped foot near the entrance of MyPediaClinic (Al Razi building 64) in Dubai Healthcare City I knew I was in for a treat. Stop the press! Mom’s are you ready for this…I have finally found the ONE pediatric doctor/clinic I feel COMFORTABLE & SAFE knowing that my babies are being CARED for the way that they should be! PROPERLY checked from their blond little heads down to their tiny toes. This is a lot coming from a hypochondriac, overly paranoid mother. 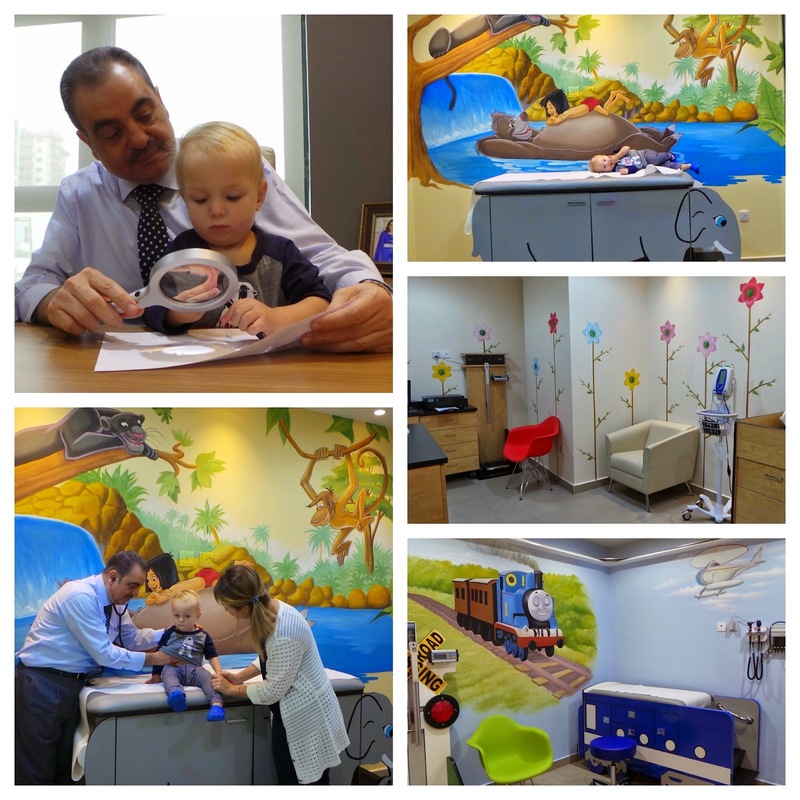 Dr. Medhat does not cut ANY corners and his brand new clinic is state of the art. You will not feel rushed as he is there to answer every last question you have without making you feel like the hypochondriac/paranoid mother that you may or may not be! I feel SO happy to have found this special doctor and BEAUTIFUL facility. From the moment I entered his clinic, I was greeted by kind and cheerful staff. Actually go back a beat, it all started in the confirmation emails they sent me leading up to my visit. So professional and switched on. I have no doubt Dr. Medhat’s clinic will have all mother’s fighting to get their babies on his patient list! 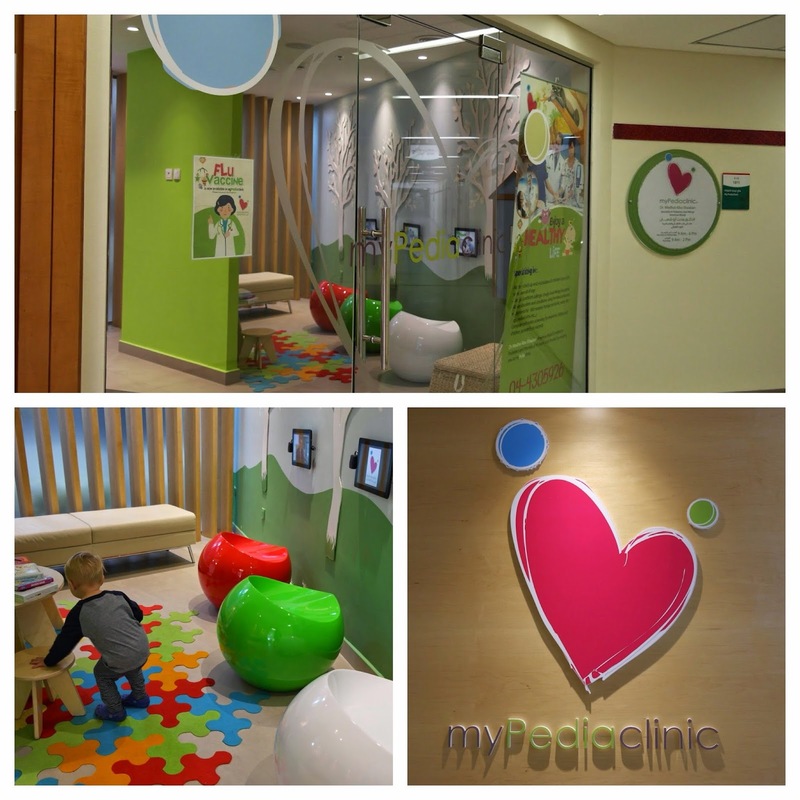 The warm and inviting color palette with the sweet heart emblem for the MyPediaClinic logo makes you feel happy. Not something you would usually relate with going to the doctors! It didn’t take long for my shy boy Nate to be overly calm and relaxed with Dr. Medhat. No crying, no tears, not even a fuss! He soon was sitting on his lap making notes in his office. AMAZING! It was like they were best pals! It also helps that this office is nothing like I have ever seen or experienced. Designed by a top American interior designer who covered every single detail of this clinic. We were first escorted to the vitals room, where yes you guessed it, had the usual vitals/weight/height & the most precious test of all (which I will cover later). This room is fresh and happy with hand painted flowers and a bed to place your infant on while having their routine check (so they cannot fall out). Let’s not even go there after I had Ruby…her pediatric doctor at a well known hospital in Dubai put her on an adult sized exam table and the poor thing rolled over as I was reaching for a clean diaper. She came THIS close from falling off at a mere few weeks old!! Don’t ask me how she managed to roll at such a young age, but she did! When I saw this added touch Dr. Medhat put in, it was a sigh of relief. I would never want another mom to experience what I went through. I can still feel my veins and blood pumping and a nervous sweat working up just thinking of that day back in 2010! The Thomas the Tank Engine patient room was Nate’s favourite. He was totally mesmerized! Can you imagine there is a train that goes around a track along the border of the entire room? The scale looks like a signal crossing and the patient bed is a train! How original! My favourite room was the Jungle Book theme. The chairs resembling branches in a forest, warm yellow and green accents on the walls and the patient bed an elephant! The coolest thing, is that when your little one lays down next to Baloo the bear & Mowgli, it’s as if they are floating right there along with the characters in the river. 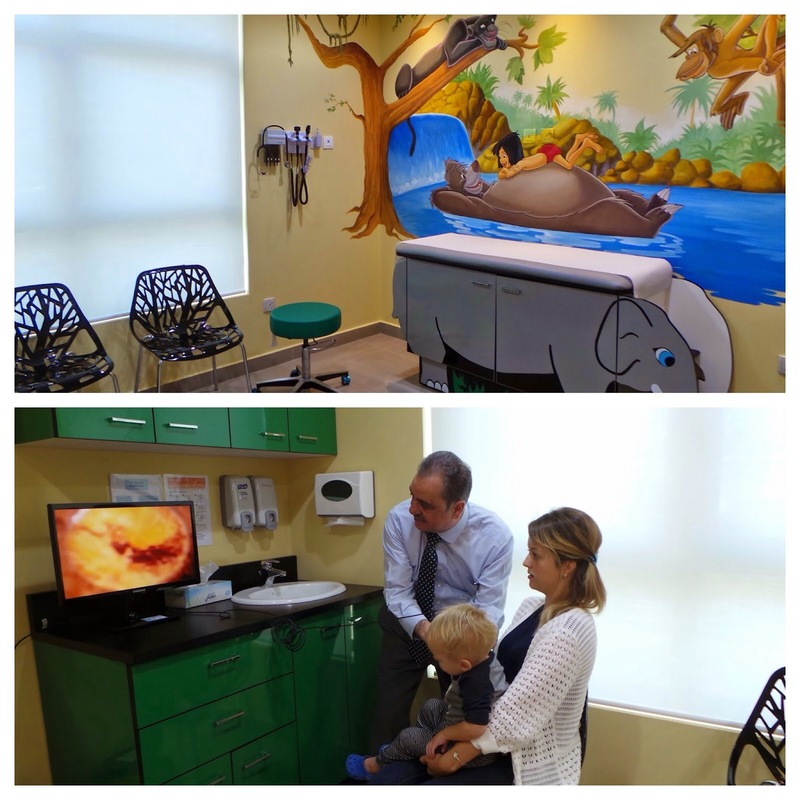 There are two other patient rooms for older children who have passed that “kiddish” stage. A world traveller room and a beach themed room. Now that I have covered just how simply creative and refreshing this clinic is; completely removing that usual cold stigma clinics come with, including the “hospital smell” I would like to move on to the next two important topics. 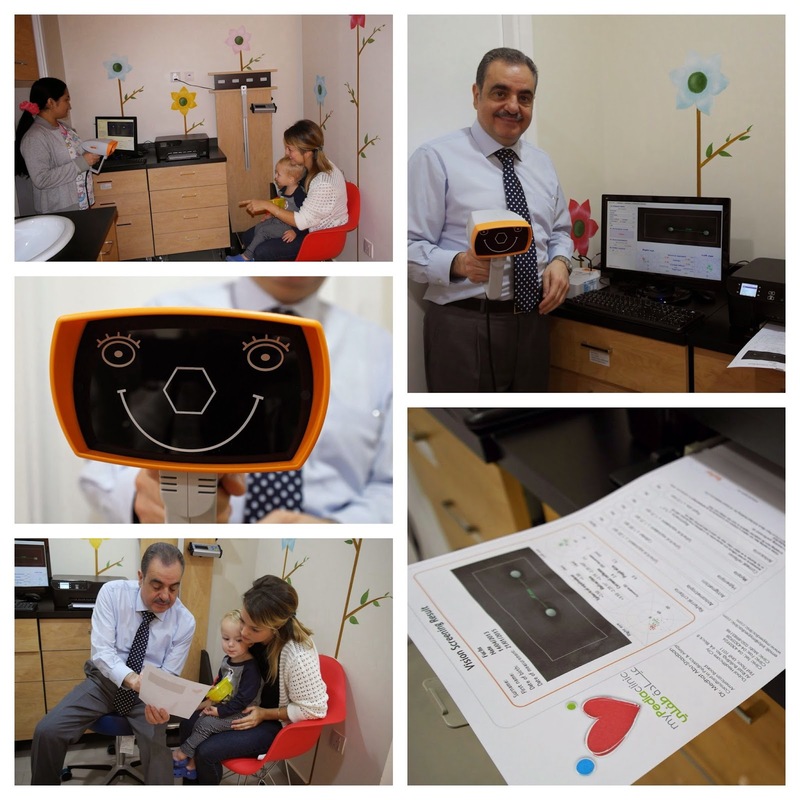 Dr Medhat has this really special non-invasive computerized vision screening machine to check children’s eyes. Saving you from going through all the unnecessary hassle and procedures of a regular lengthy visit to an optometrist. This machine pictured below gives a 100% accurate reading of your children(s) eyes. I am totally shocked, but Nate may need eye glasses! Not something that EVER crossed my mind. The test was conducted in only a few seconds. I sat with Nate on my lap as he stared intently at the happy face on the end of the handheld machine and listened to it make funny noises. As soon as the test was finished, the printer immediately shot out a printout of Nate’s exam. At the bottom of the test it says “refer”. Dr. Medhat explained each part of the test to me once it was complete. Nate now has an appointment with an eye doctor in early February! That just saved us years of Nate having to suffer. Dr. Medhat informed me that many children never have their eyes tested until they are much older. They end up having difficulties learning at school because of their vision. Which all could have been prevented with an early eye test. How would the child know the difference between normal or blurred vision if they were born that way? I recommend all parents to have their children tested ASAP! “If gone unnoticed, these issues can have a great impact on the child’s development”. Another neat machine was a video otoscope device Dr. Medhat used to check Nate’s skin and ears. It appeared on a hi-definition colored screen. By the look of my face, you can see I am disgusted! It shows WAY too much detail! Yes that is wax in Nate’s ears which will also need to be cleaned out at our next appointment in the coming weeks! Yuckkk! I could go on and on and on raving about the whole experience. Do yourself a favor and the next time you need your tot examined by someone who knows what they are actually talking about then visit MyPediaClinic. Hi Medhat…you may not remember me from your Mercy days but just wanted to say hello and so happy you are doing well. Have fond memories of those days with you, Mary Jo and myself. Take care & send me a note…if you have time.